This paper presents a comparison between a multiple response function (MR) proposed for optimization of analytical strategies involving multi-element determinations with the desirability function D, which was proposed by Derringer and Suich in 1980. The MR function is established by the average of the sum of the normalized responses for each analyte considering the highest value of these. 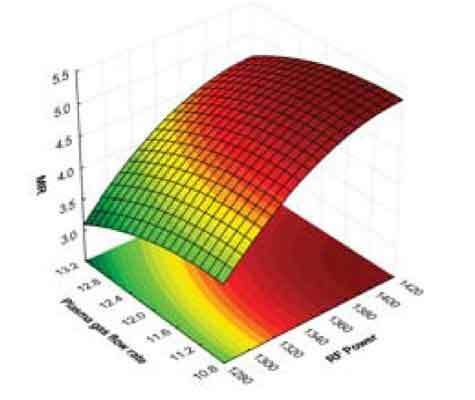 This comparison was performed during the optimization of an spectrometer for quantification of six elements using inductively coupled plasma optical emission spectrometry (ICP OES). Four instrumental factors were studied (auxiliary gas flow rate, plasma gas flow rate, nebulizer gas flow rate and radio frequency power). A (24) two-level full factorial design and a Box Behnken matrix were developed to evaluate the performance of the two multiple response functions. The results found demonstrated great similarity in the interpretations obtained considering the effect values of the factors calculated using the two-level full factorial design employing the two multiple responses. Also a Box Behnken design was performed to compare the applicability of the two multiple response functions in quadratic models. The results achieved demonstrated high correlation (0.9998) between the regression coefficients of the two models. Also the response surfaces obtained showed great similarity in terms of formats and experimental conditions found for the studied factors. Thus, the multiple response (MR) is presented as a simple tool, easy to manipulate, efficient and very helpful for application in analytical procedures involving multi-response. An overview of applications of this function in several multivariate optimization tools as well as in various analytical techniques is presented. Experimental design, desirability function D, ICP OES, multiple response function. Universidade Estadual do Sudoeste da Bahia, Núcleo de Química Analítica da Bahia (NQA), Laboratório de Química Analítica (LQA), Campus de Jequié, 45.206-190 Jequié, BA, Brazil.